Last summer I flew Canadian North, which is 100% Aboriginally-owned, from Inuvik to Norman Wells, then to Yellowknife and on to Edmonton. Really enjoyable. The aircraft interiors looked a bit worse for wear, but each boarding, deplaning and in-flight experience was what flying used to and probably never will be again most anywhere else. Genuine, courteous and attentive attendants, decent and more than enough food, on-time departures and arrivals, fee-less checked luggage that arrived when I did and respectful fellow passengers. From the counter folks to the ramp and baggage people (sometimes one in the same person), they were efficient, approachable and looked like they enjoyed their jobs. Humans. Not rude, insensitive, barking corporate bots with attitude. We’re talkin’ serious customer service. Which brings me to the airline’s tagline: “Seriously northern.” Some 50% redundant, given their name, but the first half is a winner and with so much potential. The polar bear and midnight sun logo were spot-on geographically but seemed inconsistently illustrated (even dated) alongside the more simply drawn yet delightful in-flight branding. 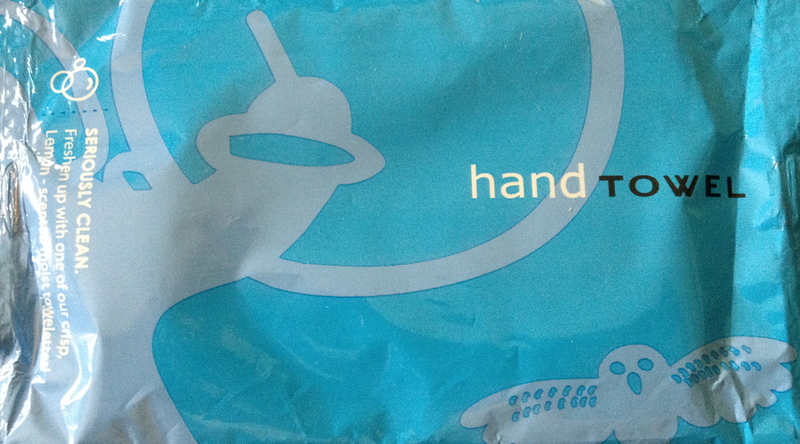 What I most liked, design-wise, were the hand towel packaging and the coffee cup (for another post). On the wipe: “Seriously clean.” — the native drummer dressed in traditional skins and snowy owl (ookpik) culturally reflecting the Northwest Territories’ First Nations who live near the Arctic Circle. A great start, if not messaging teasers. I’d love to see the brand really come alive through many more elements on board, at the gate, in uniform and online. All puffed up and no air to go. Let’s get one thing straight. The World Wide Web is not a product of Lufthansa. Keep reading…the disclaimers get more granular, yet nebulous as you go down the page. 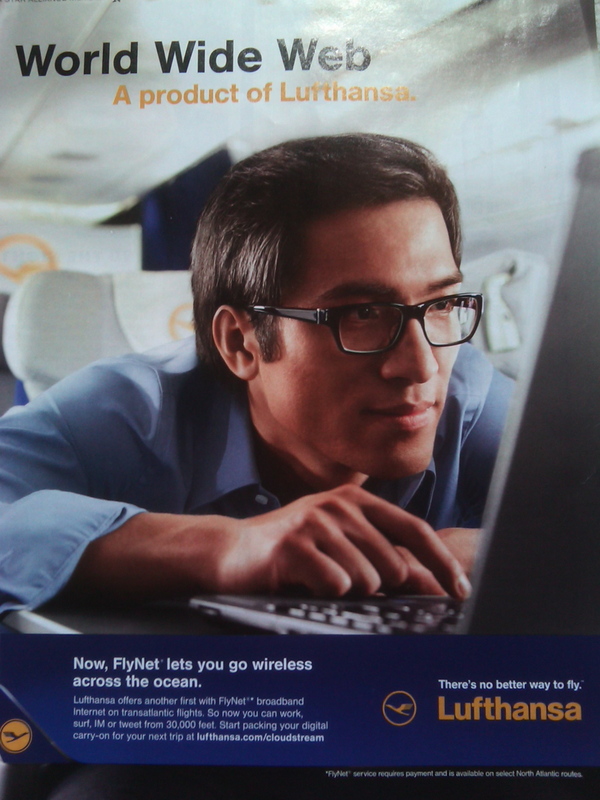 Lufty, I’ll take your word that you offer broadband Internet service across the ocean. But wait. The fine print says it’s only on transatlantic flights. Oh, and with my loupe I now see that it is available only on “select North Atlantic routes.” This ad is as shifty as the onboard service is sketchy. True, there IS a better way to fly, but it’s not with you.